The National Apprenticeship Awards honours the achievements of apprentices across a broad range of UK sectors. Now in its fourteenth year, these awards are as sought after as they are nationally recognised for demonstrable professional acumen. Recognising excellence in businesses that foster their own talent, and that have provided individuals with the guidance necessary to make a great contribution to their chosen profession and sector, the awards are as illustrious as they are highly sought-after. Hosted by the National Apprenticeship Service, the awards provide apprentices with a platform the excel even further in their career and make a vital contribution to be proud of. Apprentices are also rewarded for their continuing commitment to excellence and developing their careers. 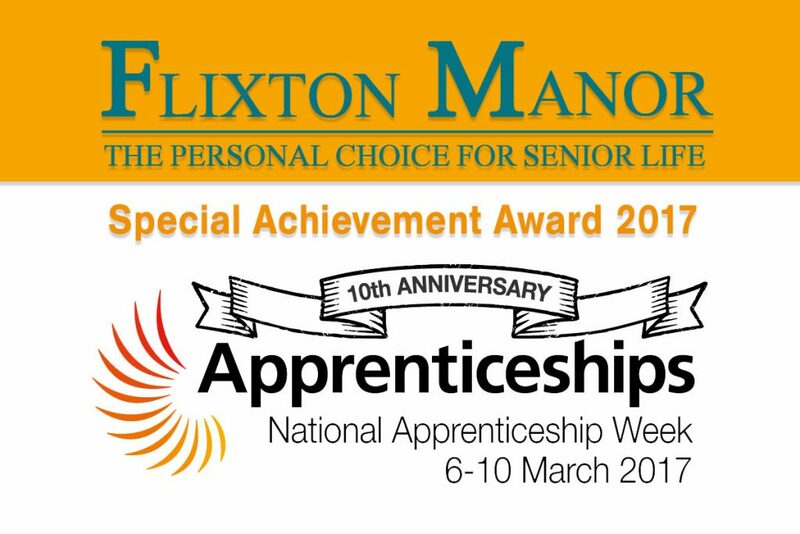 This year, Flixton Manor received a Special Achievement Award for our contribution to the care sector and dedication to develop the careers of our employees. We are very proud that our continuing commitment to nursing and residential care has been acknowledged, and very pleased that our staff have also been recognised, especially given their tireless commitment to providing unrivalled levels of care to our residents. The award has allowed us to identify key performance areas and hone best practice codes. As a progressive business, we are always looking to continually improve the level of care that we provide to residents. Despite this special recognition, we have already formed ideas of how to improve our services even more – which will only serve to help residents and members of staff in the future. A quote would be good here, something like: ‘Business director Rashad Al-Safar said, ‘It is always welcomed to be recognised for your efforts, but we are especially pleased for our members of staff who work hard to provide our dementia residents with a warm, comforting and engaging place to live.’ – This can obviously be amended to a quotation of your choice, if required. Flixton Manor progressive nursing and residential care home based in Trafford. We have more than 30 years’ experience improving the quality of life for dementia patients. Learn more about us today by calling 0161 746 7175, where one of our friendly staff would be happy to help you.